Holmes County was created in 1848. The county's namesake is a point of debate. Holmes Creek - the county's eastern boundary - bore that name before the county was created, but it was originally named Weekaywehatchee (a Creek Indian name meaning "spring creek"). One claim is that the county was named for Thomas J. Holmes, who came from North Carolina to settle in the area about 1830. Another is that it is named after Holmes, an American Indian chief who settled in the area with his band of Red Stick Creek Indians after 1814. He was subsequently killed in 1818 by a raiding party sent by Andrew Jackson during the First Seminole War. Holmes County has had four county seats in its history. The first was Hewett's Bluff (later renamed Bear Pen, then Cerro Gordo), then Pittman's Ferry, then Westville, and finally Bonifay. Bonifay has been the county seat since 1905. According to the U.S. Census Bureau, the county has a total area of 489 square miles (1,270 km2), of which 479 square miles (1,240 km2) is land and 10 square miles (26 km2) (2.1%) is water. It is the fifth-smallest county in Florida by total area. As of the census of 2000, there were 18,564 people, 6,921 households, and 4,893 families residing in the county. The population density was 38 people per square mile (15/km²). There were 7,998 housing units at an average density of 17 per square mile (6/km²). The racial makeup of the county was 89.79% White, 6.51% Black or African American, 1.01% Native American, 0.39% Asian, 0.03% Pacific Islander, 0.79% from other races, and 1.48% from two or more races. 1.93% of the population were Hispanic or Latino of any race. There were 6,921 households out of which 30.90% had children under the age of 18 living with them, 55.60% were married couples living together, 10.80% had a female householder with no husband present, and 29.30% were non-families. 26.10% of all households were made up of individuals and 12.40% had someone living alone who was 65 years of age or older. The average household size was 2.43 and the average family size was 2.92. In the county, the population was spread out with 23.10% under the age of 18, 8.80% from 18 to 24, 29.30% from 25 to 44, 24.00% from 45 to 64, and 14.80% who were 65 years of age or older. The median age was 38 years. For every 100 females there were 112.90 males. For every 100 females age 18 and over, there were 113.60 males. The median income for a household in the county was $27,923, and the median income for a family was $34,286. Males had a median income of $25,982 versus $19,991 for females. The per capita income for the county was $14,135. About 15.40% of families and 19.10% of the population were below the poverty line, including 25.70% of those under age 18 and 17.90% of those age 65 or over. The so-called "Dominickers", a number of related mixed-race (white, black, and Euchee Indian) families, lived for decades after the Civil War and well into the twentieth century in a rural area near Ponce de Leon, with a separate church and segregated public elementary school. Although considered a separate ethnicity from both whites and blacks, many Dominickers married into local white families, so that group boundaries blurred; some descendants still live in the area. The 1950 federal census identified 60 members of this group living in Holmes County at that time. Few facts are known about their origins, and little has been published about them. The Holmes County Public Library is the county's main library. It is located at 303 North Etheridge Street, Bonifay, Florida 32425. The branch is open Tuesday-Friday 8:00am–5:00pm, and Saturday 8:00am–12:00pm. Holmes County is also a part of the Panhandle Public Library Cooperative System. The PPLC also includes Calhoun, Jackson, and Washington counties. 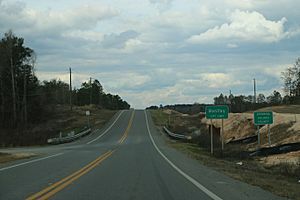 The Holmes County sign at Bonifay on SR79. Holmes County, Florida Facts for Kids. Kiddle Encyclopedia.